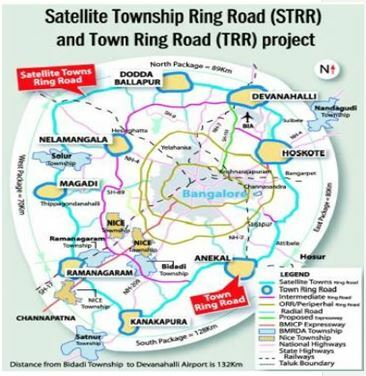 The long-delayed Satellite Town Ring Road (STRR) around Bangalore has finally received a fresh lease of life from the Central Government under the Bharatmala Pariyojana and is ready to become a reality. The 204 km-long expressway will not only improve the inter-city connectivity but would also decongest Bangalore with the development of new satellite towns alongside. The six-lane Satellite Town Ring Road (STRR) project, also known as National Highway (NH) 948A, aimed to decongest the traffic-prone areas of Bangalore is finally going to take shape. The 204 km-long and 90 m-wide stretch will be constructed in three phases on the lines of the Sardar Vallabhbhai Patel Ring Road in Ahmedabad and will run through 12 neighbouring cities encircling Bangalore. The cities include Hoskote, Devanahalli, Sulibele, Doddaballapur, Sarjapur, Kanakpura, Attibele, Tattekere, Dobbespet, Magadi, Ramanagara and Anekal. The STRR Planning Authority, with its jurisdiction over 331 villages, has already started working on the master plan of the high-speed corridor. The project will be developed under the hybrid annuity model at an estimated cost of Rs 5,500 crore excluding land costs. 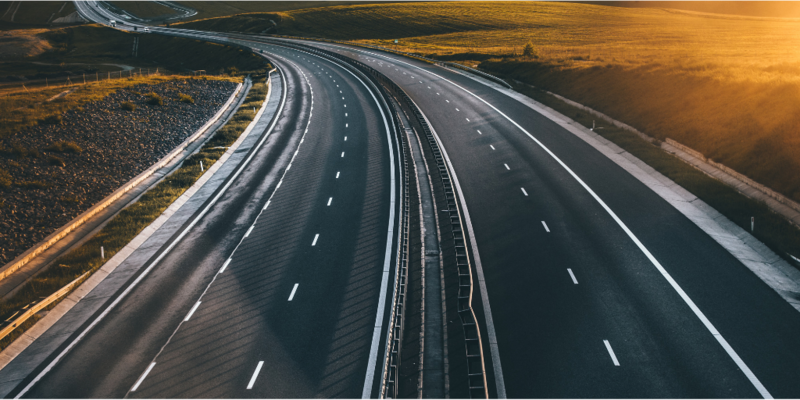 The model will have National Highways Authority of India (NHAI) funding 60 percent of the project cost along with the State governments of Karnataka and Tamil Nadu pooling the remaining corpus. The Bangalore Metropolitan Regional Development Authority (BMRDA) has also planned Individual Town Ring Roads (ITRR) of 163 km. Overall, BMRDA intends to undertake 367 km road development around Bangalore to augment connectivity and give a fillip to the real estate prospects. The project was initially announced in 2006; however, could not take off earlier owing to delayed approvals from multiple authorities, and lack of funds for land acquisition with the State government. Nevertheless, the Union Surface Transport Minister has provided it with the much-needed impetus by incorporating it under its new umbrella program, Bharatmala Pariyojana . As a part of the project, new economic corridors will be developed along with the STRR. In the first phase, the development will start from Oblapura Village at Neelmangala Taluk in the outskirts of Bangalore to State Highway (SH)-3 near Kailancha village in Ramanagara District. A total of 82 km stretch will be developed in Phase I in three years. The development will ensure hassle-free inter-city connectivity preventing the vehicles from entering the busy routes of Bangalore. For instance, people travelling from Ramanagara to Hoskote can directly reach their destination via STRR sans entering Bangalore. Besides, the development will also reduce the travelling time between Hoskote and Dobbspet from 2.5 hours to 1.5 hours. Once the project is commissioned, travellers can bypass Bangalore and other satellite towns to head towards Dobbspet and vice-versa directly. Besides smooth inter-city connectivity, the circular development will significantly improve intra-city connectivity, too. For instance, the stretch would reduce the travelling time from the prominent IT hubs of Whitefield and Electronic City to Kempegowda International Airport by 4-5 km. 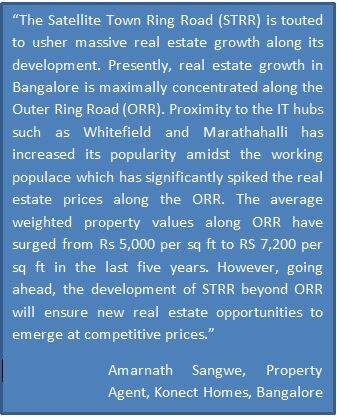 With Bangalore nearing saturation in terms of developable land parcels, a plan to develop satellite towns in its vicinity and linking them with STRR will go a long way in triggering real estate growth. The government envisions replicating the benefits of Bangalore such as sound infrastructure, educational opportunities, employment options and residential opportunities in the adjoining towns to ease the burden on the former. The future benefits derived from the project are expected to be in line with the satellite cities of Noida, Gurgaon, Ghaziabad and Faridabad which have emerged as the noted commercial and residential hubs near Delhi and are home to millions of migrants.